Two people have been arrested on suspicion of money laundering and seven others safeguarded following a series of warrants targeting suspected human trafficking and modern day slavery across Bedfordshire and Northamptonshire. 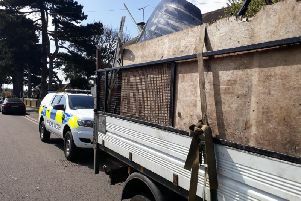 Officers from the Eastern Region Special Operations Unit carried out warrants on Tuesday morning on properties linked to nail bars in George Street in Luton, Wyatt Road in Kempston, Midland Road in Bedford and Silver Street in Kettering. A 40-year-old man and a 19-year-old woman were arrested at the Wyatt Road address and remain in custody at Kempston. Seven people have been taken reception centres run by The Salvation Army charity to establish whether they have been subjected to any trafficking or modern day slavery offences. The Salvation Army’s Director for Anti-Trafficking and Modern Slavery, Anne Read said: “The Salvation Army is working with ERSOU to provide reception centres for immediate support for potential victims of modern slavery, as well as arranging the longer term support many so desperately need and deserve. “It is vital that all victims’ needs are assessed and they receive immediate access to specialised support.